Changing your hat band is an excellent way to coordinate your hat to an outfit, add color and personality to a classic hat, or refresh an older hat. With a little additional effort, you can easily design changeable grosgrain ribbon hat bands. Add flowers, buckles or trims to your hat bands to make it easier and faster to change the look of your hats. You will need grosgrain ribbon, small sew on snaps, a needle and thread, and a commercial anti-fraying product. Remove the hat band and any trims on your hat. Use a bit of steam from a steam iron if necessary to loosen old adhesives. If your hat is wool, clean it with a soft, damp brush. A straw hat can simply be cleaned with a dry brush. A damp soapy cloth can be used if needed. Gently reshape the hat over rolled newspaper or a head-shaped form as necessary. Steam can be used to assist in shaping as well, depending upon the hat. Once your hat is clean, fresh and nicely shaped, you are ready to proceed with adding a grosgrain ribbon hat band. Choose a grosgrain ribbon between one and three inches wide, depending upon the hat. Solid and printed grosgrain ribbons are available, allowing you to accent any hat you might have. Even wider ribbons may be appropriate for some hats. Measure the crown of the hat. Cut a length of grosgrain ribbon approximately 4 inches longer than this measurement. Treat each cut end with a fray stopping product like Fray Check. Use a cool iron to press the ribbon under 1 inch on each end. Use a needle and thread to stitch these hems into place. Sew sew-on snaps into place, allowing for a 1 inch overlap. Use two snaps for a 1 inch ribbon, adding an additional 1/2 inch snap for each 1/2 inch of ribbon. If you are using a very wide ribbon or plan to add heavy flowers or accents, consider using a fusible adhesive to bond two pieces of grosgrain ribbon together or stitching two lengths of ribbon together to form a double thickness. You can add any embellishments you like to your grosgrain hat band. Stitch these into place with a needle and thread. You may want to use a small piece of felt to stabilize the decorations on your hat band. You can also opt to make a small, flat ribbon bow to cover the snap panel on your hat band. 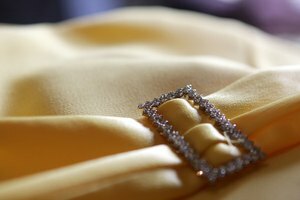 Choose decorations and embellishments that work well with the style of your hat as well as with your ribbon. 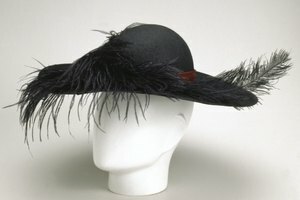 If you are decorating a more formal hat, you may find that a satin ribbon works better than a grosgrain one.